This is a compact and portable illusion, which makes a bigger audience impact than many larger and more elaborate props. 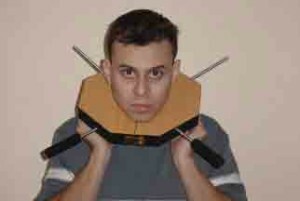 Two Skewers, shown to be solid and rigid are passed criss-cross fashion through a spectator’s neck. An alternate and slightly more saucy presentation for an adult audience would be to pass the Skewers through a lady spectator’s thigh ! Although similar in effect to the Sword Through Neck, this will baffle even magicians familiar with the basics of that effect. The Skewers are shown rigid and solid. They criss-cross at right angles, and you push them in one at a time ! No assistants – you can use any spectator. Supplied complete with Special frame (that does it all), the Skewers in a handy carry bag, (which hooks to your belt or trouser for the performance), and everything you need to perform it right away. And its easier than you think – you can put it into your act the day you get this, though for an illusion of this nature, we would recommend a little more time for thought to the presentation. And the price is very reasonable – much lower than what you would expect for an illusion of this caliber.